An owner-managed hotel, stylishly maintained and presented, ideally located for walking, bird watching and cycling in the heart of Derbyshire's Peak District. Formerly a 500-year-old inn, this highly rated Derbyshire hotel in the heart of the scenic Peak District has been transformed into a relaxing haven in which to unwind. Featuring award-winning cuisine by Chef Helen Heywood, its friendly and unobtrusive service ensures The George retains its charm and character whilst offering all the modern amenities you would expect. Recently refurbished, these rooms are light and airy, with modern colours and fabrics. Traditionally furnished and generally larger than our standard rooms, superior rooms include DVD player, bathrobes and private mini bar. The largest room we offer, with feature 'St George' stained-glass window, including settee, mini bar, bathrobes and (of course) the 4-poster bed. Three double rooms of this type are available, each located at street level, but still with access by stairs. All rooms include private bathroom, tea & coffee-making facilities, reading books, sufficient space for work or study, free wifi access, direct-dial telephone and television/radio combined. George's Restaurant is extremely popular - book a table when reserving your accommodation as tables cannot be guaranteed upon your arrival at the Hotel. The recent refurbishment in George's restaurant lends a contemporary feel, with cool colours, wooden flooring and feature lighting - a modern style complimenting Helen’s modern, innovative style of cooking. You will find the service friendly, efficient and relaxed with a minimum of fuss or interruption. Formality is not on the menu! The George is available on an exclusive use basis for Weddings and private celebrations and events, ensuring your guest’s private use of the hotel facilities, public areas and bedrooms throughout their stay, from the pre-arranged arrival time of your function until after breakfast the following morning. Of course, this also means our team at The George will be at your disposal. Another advantage of choosing The George for your wedding is the access it affords to our own personal wedding advisor. Kathryn Joseph has a great deal of experience in organising weddings and will be able to advise you every step of the way to ensure that you have a superb day. Commerce and shopping in the major city of Sheffield - 12 miles away. The crooked spire on Chesterfield's Parish Church - 16 miles away. The ancient and picturesque market town of Bakewell, famous for the Bakewell pudding, with Monday market and antique shops - 7 miles away. l History and culture at Chatsworth (7 miles), Hardwick Hall and Haddon Hall. Climbing and walking in the scenic Peaks and Pennine Way. Cycling from Tissington and Monsal. Potholing, open mines and show caverns at Castleton. Skiing facility at Sheffield's dry slope ski centre. Theatres at Buxton's Opera and Sheffield's Crucible and Lyceum. By Rail: 3 hours from London St Pancras via Sheffield. 20 minutes from Sheffield Station. 5 minute walk from Hathersage Station. By Road: 3 hours from London via M1 - Junction 29. 30 minutes from Sheffiled on A625. 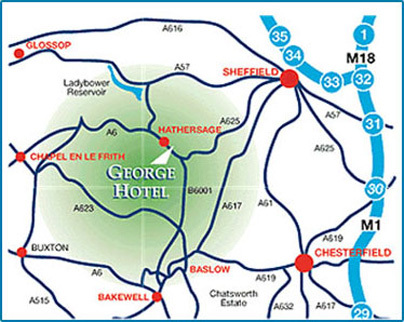 Airports: The George Hotel is located about 1 Hour from both Manchester and East Midlands Airports.